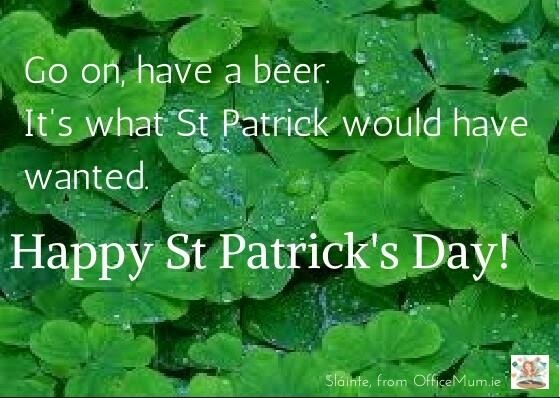 So today is St. Patrick’s Day or Lá Fheile Pádraig and all over the world communities are celebrating with parades, a day off work, wearing shamrock on their lapel and downing a pint of the black stuff. 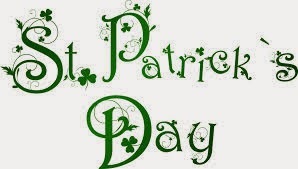 This morning Oldest Boy asked me why 17th March was picked to be St. Patrick’s Day. Was he born today? Did he die today? 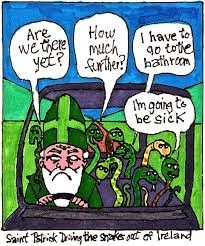 Was today the day he drove all the snakes out of Ireland? I couldn’t answer him despite having celebrated his feast day all of my life so realising I knew nothing about the man, I made a swift appointment with Dr. Google. I discovered, amongst some other interesting facts, St. Patrick is reputed to have died on 17th March, hence the birth of St. Patrick’s Day. Shock! He was born in Britain. His parents are believed to have been Romans of some means complete with slaves. Ireland was water locked thus making it impossible for snakes to have ever been here. Maybe they confused them with politicians. Going so far as to encourage people to indulge on his feast day. Rumour has it he gave out to an inn keeper who was a bit mean with his measure. Maybe he was Irish after all. Apparently he favoured blue clothing and not the ubiquitous green we see on his feast day. Captured when he was a teen he didn’t turn to god until he was an adult. Tending sheep all day in the Irish countryside might just do that to you. The voice urged him to make his way to a port where a ship waiting for him would take him back to Britain. The unlucky soul was captured during the attempt and was taken to France where he spent 60 days and was introduced to the monastic life. They say god loves a tryer and it obviously worked for Paddy who made another run for it. This time he was successful and became a priest eventually becoming a bishop. It appears things took off for Paddy in his thirties. He returned to Ireland where he successfully converted Celtic pagans to Christianity. Not really but he is responsible for it becoming an Irish symbol. 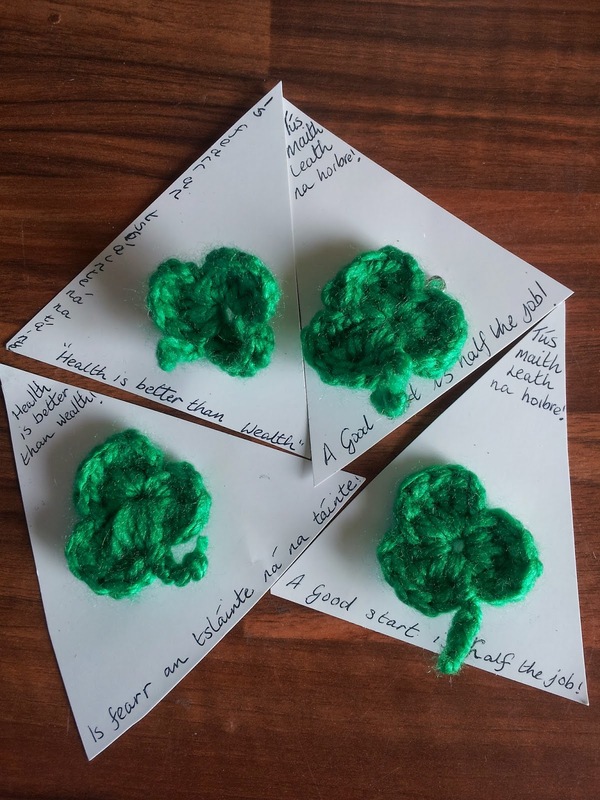 As a preacher St. Patrick used it to represent the holy trinity: the father, the son and the Holy Spirit. BC (Before Childers) St. Patrick’s Day was a very important day for me purely because it meant extra time off work or school but since becoming a parent, like the weekends, it is now just another 24 hours. A day spent inventing excuses not to take four small boys into a bustling town to stand behind scores of people and look at their arses because they are too short to see anything above that height. I possess just one pair of shoulders and they are reserved for my bag so learning from previous years of, “I’m bored,” “I’m cold,” “I’m hungry,” “When can we go?” “I can’t seeeeeeeeee,”and usually in wet rain, this year I took a different approach to our public holiday. 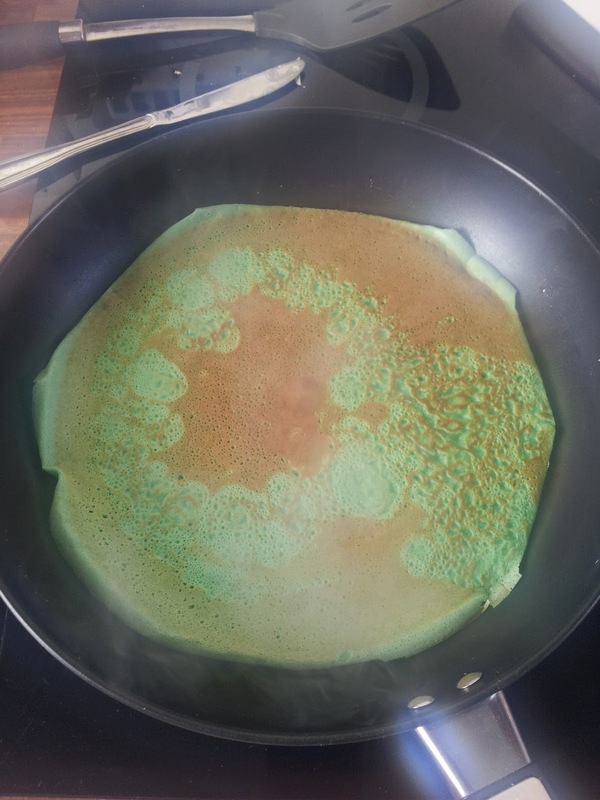 We had pancakes for breakfast and one of them was coloured green for the day that was in it. I made only one because I knew it would be received with strong suspicion and slight disgust. “That looks like someone sneezed on it!” The other pancakes were greeted with great enthusiasm and hovered up. 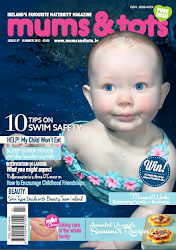 Then we went for a family swim which was lovely. Home for a quick snack and the afternoon stretched before us. Sometimes kids have great ideas and one of them suggested bringing the pooch to the woods. This beat my unvoiced idea of the playground hands down. We had a lovely hour and a half of aimless wandering around where small voices asked “are we lost?” once or twice. When one of them wanted to know, “are we going to die here?” I thought it was time to “find” the correct trail back to the car and go home. The secret, dear reader, to a successful bank holiday weekend with kids, is to run the collective backsides off them. On returning home one of them will inevitably fall asleep in the car. On getting into the house, the others will sit, silently watching the goggle box. It was a minor St. Patrick’s Day miracle in itself. Three of them sat side by side without killing each other over remote control rights and couch space. They were too tired to do anything else except talk nicely to each other and watch television in agreeable companionship. Me? Back in the kitchen making my second large batch of pancakes of the day. Lá Fhéile Pádraig gach duine!